Tree Trimming Services in Argyle, TX - Call Justin-Time Today! Justin Time Tree Trimming is proud to announce our services now extend into the growing community of Argyle, TX. If you need basic or complicated tree removal or simple pruning, we have you covered. 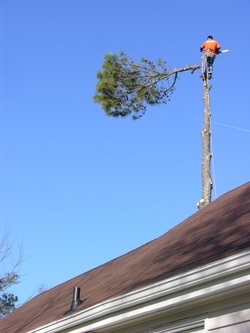 We are a fully insured tree service company who puts quality first! We look forward to hearing from you and earning your business. We offer free quotes on every job! Slash pine tree info: The slash pine is considered the king of east Texas evergreen trees. This fast-growing pine is great in sandy soils, but worthless in most clay or alkaline soils. The slash pine always grows very straight. Other similar variety are loblolly and the popular long-needle pines. Although the slash pine will grow in all the areas of DFW, it must be planted in sandy spots in those areas. Avoid alkaline clay soils at all costs if you decide to plant a slash pine! Habit: Fast-growing, weak-wooded, short-lived junk tree. Culture: Grows about the same in any soil. Uses: Fast-growing temp. tree. Low quality firewood. Problems: Chlorosis, borers, cotton root rot, short life, weak wood. Not recommended for planting in Texas!